In the era of electronic media, few people bother reading print media that coffee tables are originally intended for. Despite this, coffee tables are still an important piece of furniture in every home. Coffee tables can be used for serving light breakfast or dinner, doing minor repairs and home creativity. 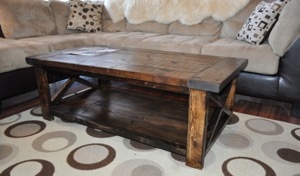 The simple structure, the variety of shape and design, minimum tools make coffee tables popular among household masters. 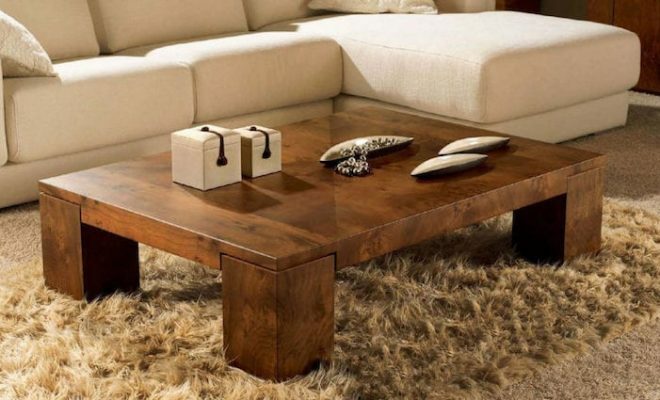 In this article, we will cover in detail popular DIY coffee tables and give practical recommendations on how to do them. 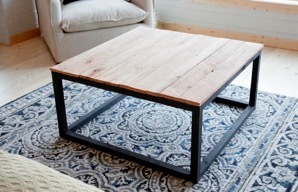 The easiest way to do a DIY coffee table is to use boards made of unedged planks, veneered chipboard or MDF panels. To make joints of plates less visible, a classical method is used – assembling on round wooden spikes (dowels). A household master only has to accurately mark the location of dowels on the ends of sidewalls and drill the mounting holes in the lower and upper lid. To make the structure more rigid, install a vertical crossbar between the side walls. A small niche for magazines and other small items can be handy here. It can be made from a plate remaining after cutting lids and sidewalls. Mobility is a useful coffee table feature. 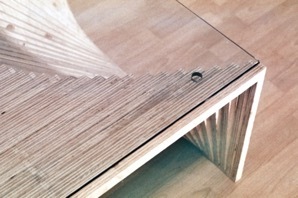 It is implemented by installing furniture wheels on the table bottom. Compact transport wheels can be hidden, while larger wheels can be highlighted on purpose. 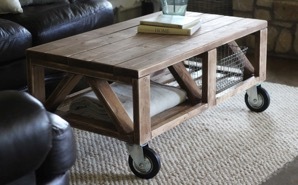 As a result, you will have an original coffee table on wheels made from polished bars, supporting a massive wooden tabletop. 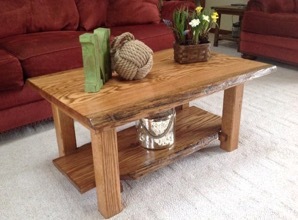 If mobility is not important for you and you want a solid rustic coffee table, we can suggest a coffee table made from solid boards. 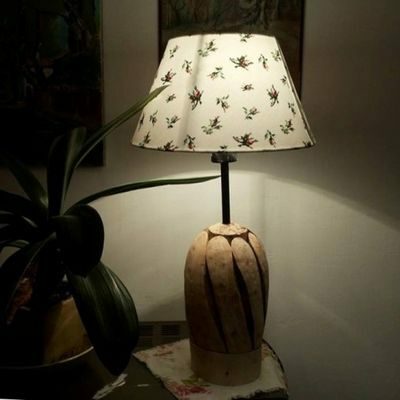 It will definitely become one of the main decorations in a living room of any country house. The idea of using “random” objects to create home furniture turned out to be extremely efficient. It gave life to various DIY items made of boxes and pallets. 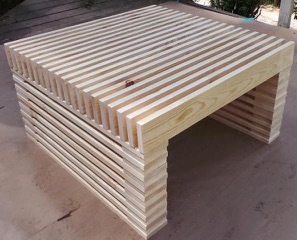 A little imagination and minimum costs are all you need to assemble a wood coffee table on the basis of four standard boxes. The assembly algorithm is the following: put boxes on the edges, one by one in a circle. Connect them with self-tapping screws and do a shelf in the center. You can put a flower vase or add the decoration of river pebbles or shells here. 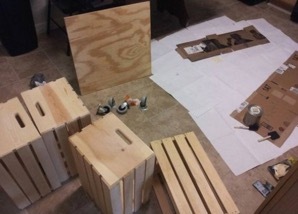 To finish, process the wood with sandpaper, stain, and varnish. Natural wood needs no refined decoration. If you use it for interior decoration, complement the environment with a simple table. To assemble it, you will need several planed bars and slats of fencing wood. The base frame will look safe and solid if using a contrasting color with a tabletop. For that, cover the bars with dark stain, while a tabletop is in the natural pine log color. 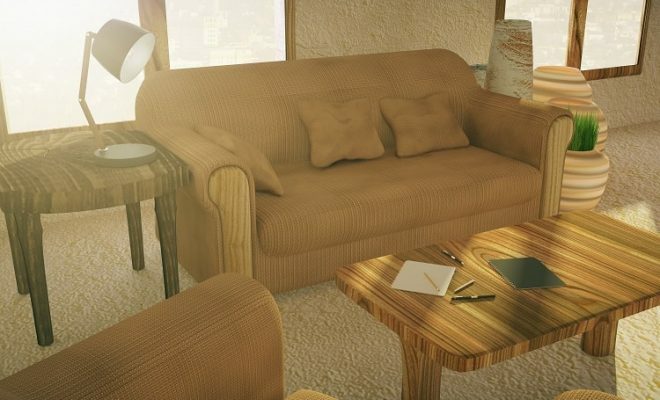 Wood in the furniture can be combined with metal. 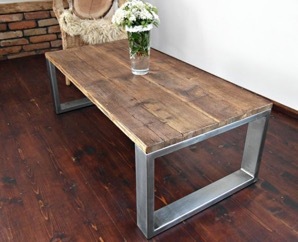 You can see this for yourself by making a loft coffee table on metal legs. The tabletop is made from three pieces of floorboards and framed by a hood mold. To do table legs, you will need a welding machine, a piece of steel plate 1.5-2.0 mm thick and several cuttings of smooth reinforcing steel with a diameter of 10-14 mm. First, bend four bars according to the scheme, then weld square pieces of plates (or thick carpentry corners as on a photo) to them and fasten them one by one to the table-top made from the floorboard. For final finishing, polish, tarnish and varnish the table-top, sides and paint table legs. The basis can be made with a rectangular cross-section shaped tube instead of a rod. Weld two rectangles of it, clean the seams, cover the metal with silver paint and you will get reliable supports for a tabletop made from thick oak boards. For increased stability, metal sidewalls under the tabletop are connected by a section of a shaped tube. 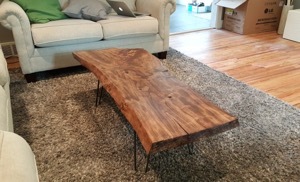 Coffee tables with a tabletop made of sawn log end look very beautiful and impressive. Finding the log ends is not very difficult. Any sawmill will offer you a “half-finished product” of the right size. While an electric plane and a belt electrical polisher will help you bring it to the right state. 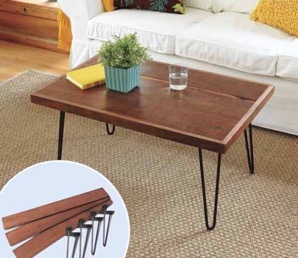 Table legs can be made from thick wood bars or a reinforcing bar. The contrast between a solid countertop and a light metal base will add your table a touch of exclusive design. Another interesting combination of materials is wood and glass. 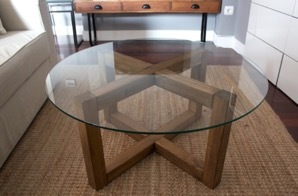 A tabletop can be oval or round, supported by a cross-shaped base of two bar frames. The “weightless” glass is perfectly combined with a massive wooden frame of the basis. 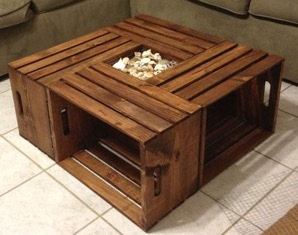 A portable coffee table made from a wooden pallet and covered with square glass looks both stylish and modern. Glass makes the whole structure look rich and covers gaps between pallet planks, that small objects can fall to the floor through. 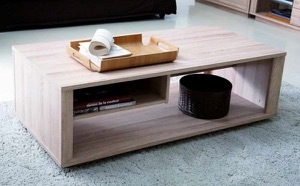 If your focus is functionality, you will definitely like a transforming coffee table. In a few movements, it radically changes not only its height but also the look. It is a usual stand for magazines and newspapers when assembled. Raising two sidewalls with legs, we increase the table height and extend the tabletop surface to the “lunch format”. The basis of another transforming system is two metal frame stands. Each of them is hinged to the tabletop. The stands are horizontal when assembled, but turned on the hinges and stand upright when the tabletop is lifted up. The table height when unfolded is 73 cm. 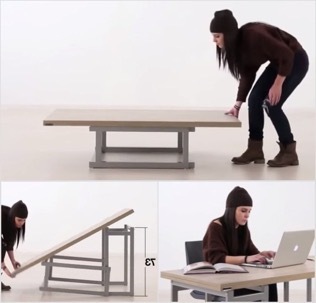 This allows using it as a computer table. 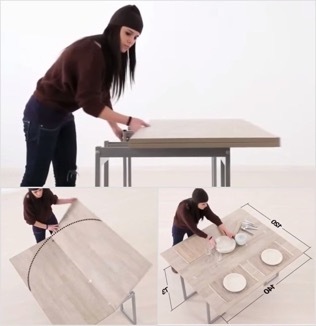 The tabletop consists of two plates, that can be shifted horizontally. At this, one plate rotates on the hinge around its axis. 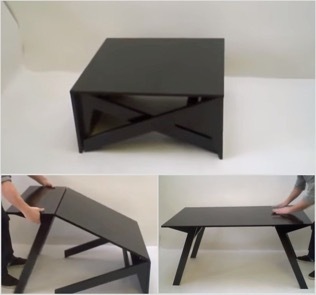 Such a transformer can become a dining table for 4 persons in a few seconds if necessary. Some people create folding adaptive systems, while other successfully experiment with usual plywood scraps. 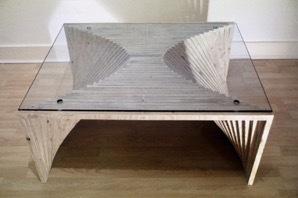 The result of this search for new forms is such an unusual coffee table. We can only wonder at the scrupulous accuracy of its calculation and talented embodiment in a visible form. Everything looks simple in a theory: the base is consistently glued from three dozen plywood frames. Each of them has a certain angle of the leg inclination. While in practice, a three-dimensional simulation program must be used to calculate all the elements of a plywood stand. The plywood “pie” assembled together captures the eyes with its unusual futuristic shape. The crown of this piece of innovative carpentry technology is a glass cover. “I would like something simpler, but also beautiful,” a household master may say. Here you are, the same elegant, but an easier to do a table. It consists of three packages of thin planed boards. Plenty of slots in the composing tabletop can be covered with a glass lid. We should say a few words on connecting glass with wood. The best solution is using transparent “optical” glue. Drilling thick glass at home is almost impossible without damaging it. So, give up the idea of mechanical fixation and allow the modern chemistry to show what it can do. To supporters of tight screw connections, we recommend using plexiglass for a tabletop. It is easily drilled and looks great.